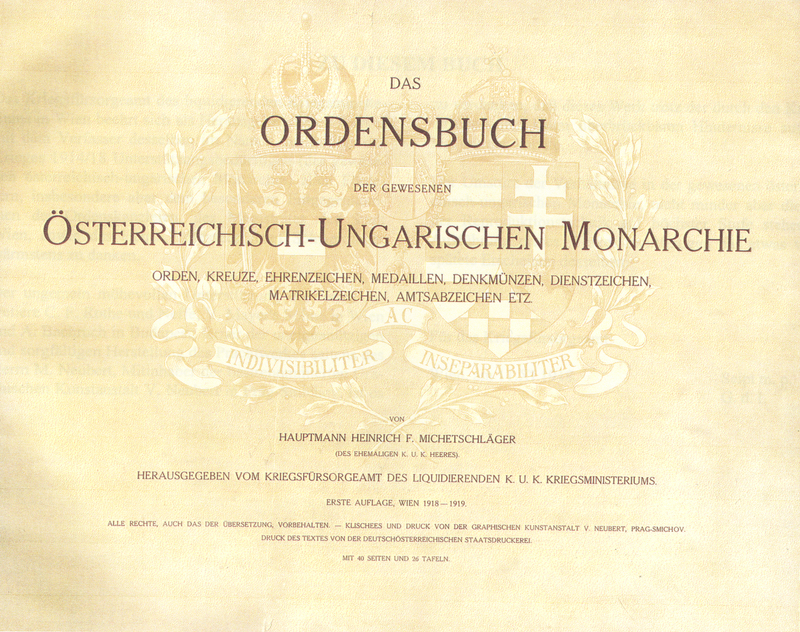 When I first started collecting the awards of the Austro-Hungarian Empire more than 50 years ago I could not find any reference materials on the subject to help in my collecting efforts. 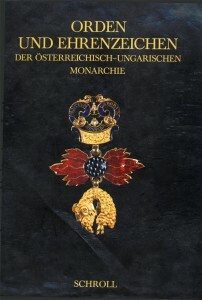 Imagine having no way of knowing, with any certainty, if an item was in fact Austro-Hungarian, when it had been issued and why, who had received it and for what reason, whether it was genuine and what was a fair price to pay for it. I was lucky in that I found OMSA early in my collecting career and met some wonderful mentors like Bob McNamara, Ken Hope and Eric Ludwigsen who shared their knowledge with me. 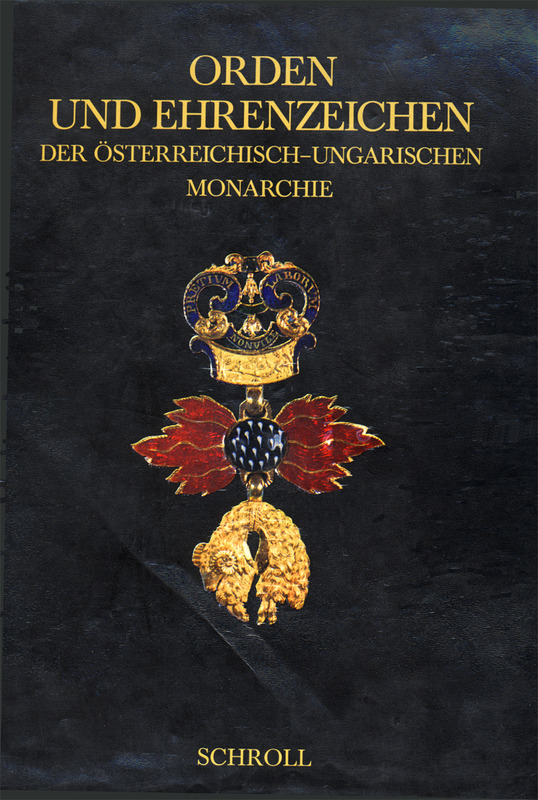 I can still remember how pleased I was when I found a copy of the von Falkenstein (Dan Ragsdale) book Imperial Austrian Medals And Decorations at a gun show. At last, a reference to in my area of interest and in English. When you look at it today the line drawings and brief descriptions are pretty unimpressive compared to data easily found on the internet. Even then I quickly felt the need for more and better information. 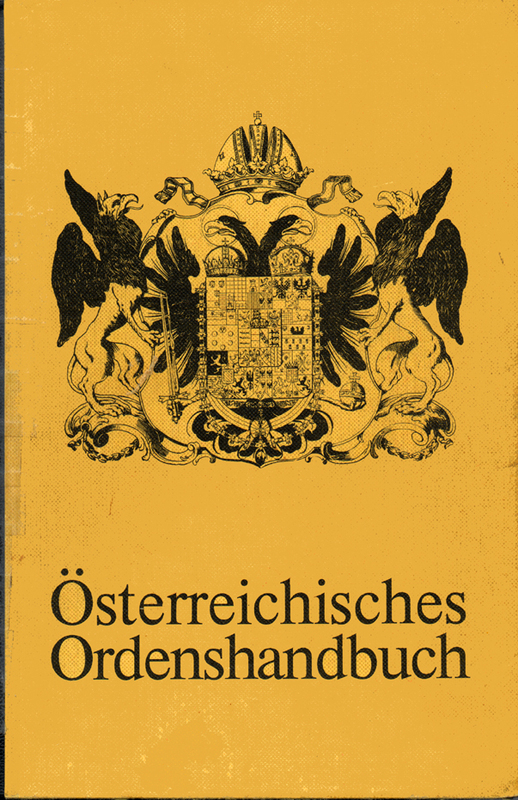 Imagine my delight when in 1974 I became aware of a new book being offered for sale in Europe: Osterreichisches Ordenshandbuch by Prochazka. Of course I ordered it immediately and then waited three weeks for it to arrive. I can still remember how excited I was when upon returning form work one day found a note in my mailbox telling me I had an undelivered package at the post office. I immediately drove there and upon getting the package couldn’t wait, and opened it in the car. I was enthralled. Here was a book with 33 pages of black and white photos of awards some of which I had never seen before and 152 pages of descriptions, sadly in German, a language I could not read. Thus began a great adventure. In the evenings after my wife was asleep I would sit down with the Prochazka book and a good German dictionary and translate. It took months and a lot of practice but eventually I had translated the book into English (I still have the typed translation in my library). 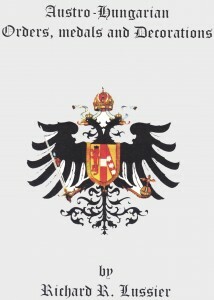 As the years passed I translated several other books and being a scientist and researcher I also kept meticulous records of everything I was learning about Austro-Hungarian Empire awards from my translations and from the information shared by advanced collectors. I carefully observed every Austro-Hungarian award I encountered and made meticulous notes on what I saw: weights, sizes, construction and hallmarks. After about 10 years I was beginning to be considered somewhat expert on the subject of Austro-Hungarian awards and had become the president of the Southern California Chapter of OMSA. I had also become the publications Editor for OMSA and a contributing author. 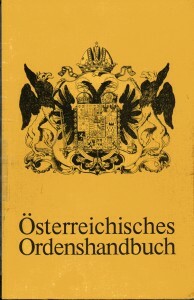 I had during this same period established an Austrian Interest Section of OMSA and published a monthly newsletter on this subject for about a 50 interested OMSA members. It was at this time that I realized that I had amassed so much information on the orders, medals and decorations of the Austro-Hungarian Empire that I no longer could remember all of the information I had collected and analyzed. This realization motivated me to write, first for my own use, and later to share with my fellow collectors an encyclopedia on the awards of the Austro-Hungarian Empire. It is now 30 years later and I have completed my work. It incorporates 3,000 pictures of awards, and related images. It is in 9 volumes and contains a total of 1,296 pages of text. I believe it to be the most complete and accurate English source of information on the subject. All data gathered from post-1920 sources such as that from Prochazka or Mericka are accepted as fact only if they are consistent with the data derived from pre-1920 sources. In those cases in which data from differing sources are in conflict those from the pre-1920 sources are given greater credence. In those cases in which a consensus is not available the data most consistent with the normal pattern followed by the Austro-Hungarian Empire is given greater weight. Data derived from post-1920 sources that cannot be confirmed by pre-1920 sources was not accepted as part of the research findings unless it could be supported by at least 2 other independent post-1920 sources or by personal observation. Given the rigorous process described above I find that I have been able to gather about 96% of the data I sought on the awards of the Austro-Hungarian Empire. One of my hopes is that through this forum and the exchange of information it facilitates you will sometimes have valid data that has eluded me and assist in filling in the gaps in my research. Lastly based on reviews of my research by other authorities on the awards of the Austro-Hungarian Empire the data I will be sharing appears to be highly accurate. However it would be foolish on my part to assume that my data is error free. Thus it is my hope that through this forum and our discussions we will be able to identify any errors in my work and correct them. The completion of this work has created a new problem. How can I share this information with my fellow collectors whether new or advanced? How can I do for you, what I wish someone could have done for me those many years ago. 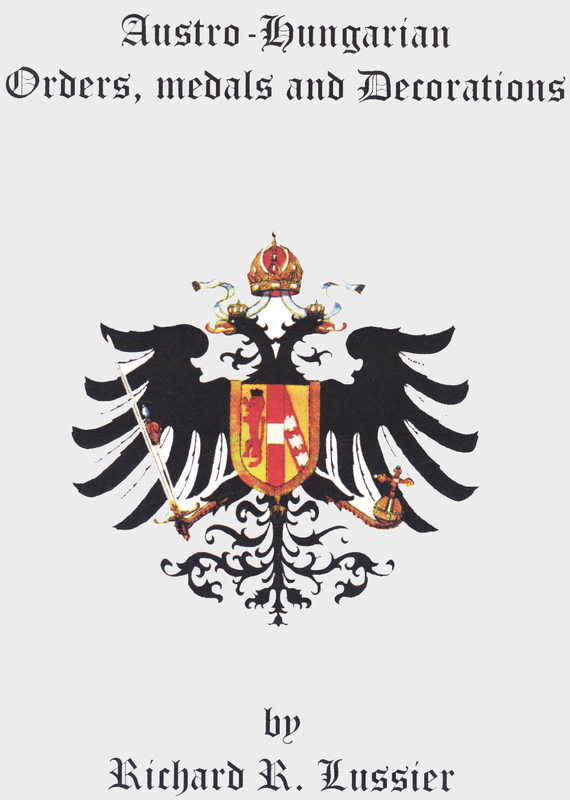 That is to say how can I share with you the information I have gathered and organized over the last 30 years regarding the awards of the Austro-Hungarian Empire and lastly how can I foster discussion from which we can all learn new information about this fascinating subject? When an award was issued? Why an award was issued? How many classes or types of the award were authorized and how many were issued? What are the interesting facts and anecdotes about an award? Weather an award should be hallmarked and if so what marks are common? What a hallmark on an item means? Exactly what an item should look like? What is an items proper size and/or weight? What genuine variations of the award exist? Who designed the award and/or who manufactured it? How many of an award was issued and in the case of awards that were issued in limited numbers the names of all of the recipients? What is the proper color and pattern of the ribbon? What are the correct ribbon attachments for an award including kleiner badges as appropriate? What cases for awards look like? Whether miniatures of the award were produced? What a fair market price for an award is based on the last five years sales? Thus if you would like to participate in a rich discussion regarding Austro-Hungarian awards then this is the place for you. I am really looking forward to corresponding with you and to our upcoming discussions. Joy! It is wonderful that you want to share the information that you have so painstakingly gathered. Looking forwards to some fascinating conversations and finding out more about Austro-Hungarian ODM. I am pleased to meet you. I hope the information I share on this blog will prove to be interesting to you. I also hope I can be helpful in answering questions you may have regarding the orders,medals and decorations of Austro-Hungary. 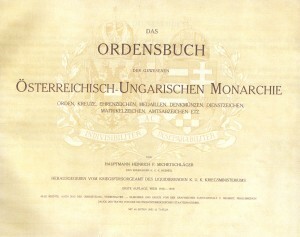 I’m glad to see how finely described are here the Orders and Decorations of the Austro-Hungarian Monarchy. By the way, I see a few pieces from my collection, here and there, among the illustrations.